This week, Survivor: Edge of Extinction finally found its footing, by focusing on its characters. Even if it (temporarily?) lost two of its biggest ones. The moment captured above during the second hour's Tribal Council — sort of a dark "The Last Supper" with seven Judases — and the rebounding, smile-filled conclusion as BIG Wendy got a nickname check and hug from Probst as she set off down the trail to Extinction, sort of encapsulates this double-episode's surprising rebound: they took a series of otherwise sorrow-filled moments, and somehow cobbled them together into a postive, season-redeeming success. A remarkable feat. In isolation, this shot is heartbreaking. It was subtly done, and perfectly executed. After the first vote resulted in a 4-4 tie between Wendy and Lauren, suddenly, Tribal Council has broken down into a cacophony of whispering. David and Wardog are approached by Eric, who proposes something, to which David objects "We just met you!" Meanwhile, Lauren has raced over to huddle with Victoria and Gavin, with Kelley following suit. As the audience is struggling to figure out what's being discussed, there's a sudden cut to this wide shot, which reveals that amidst all this whispering, Wendy is sitting completely alone, not in anyone's conversation. It's obvious how the revote is going to go down, and Wendy is well aware of it. It's a quietly devastating edit, one which actually gains power on re-watch. And yet somehow, after she is (as expected) unanimously ousted, Wendy manages to pull together some fist pumps and a smile as she makes her way over to Probst, has her request to be called "Big Wendy" fulfilled, and even sneaks in to wrap the host in a mid-snuffing hug. Everyone claps, and Eric sends her off as "one of a kind." From heartbreak to heartwarming. 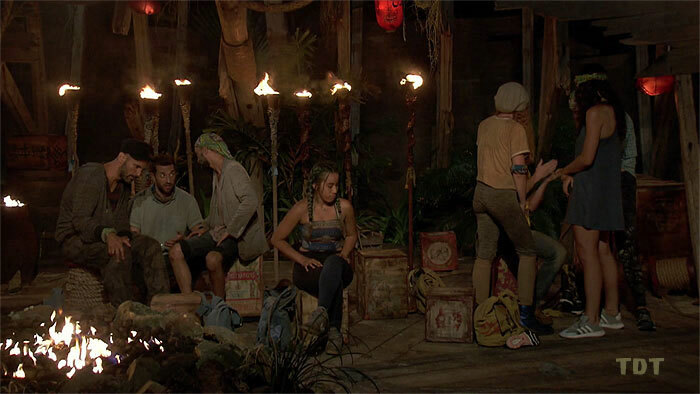 Aubry's boot and post-boot episode had a similar feel: It was stunning to see her blindsided with an idol in her pocket, but her next-day bemusement at the utter chaos on Edge of Extinction, and the neat reversal of fortune, with the three-time player as the "newbie" at Extinction, not understanding how all this map-folding business works, helped to soften the blow. And who better to present the "Get on the boat" message in the preview? Collapse, confusion, then a possible comeback? How did this all come to pass? Simply put, these episodes worked as tragic yet hope-filled send-offs because we knew who these characters were. We had seen Aubry's tears of relief over finding the idol that would (theoretically) save her from the power-hungry first-time contestants who were targeting her and Joe. We knew how much the game meant to her. We saw her determination to fight back. Then everything completely fell apart, as Aubry failed to play either her idol (which would have saved her) or her extra vote advantage (which would have done nothing). Because we'd watched her struggle throughout the season, this tragic downfall for Aubry had resonance and meaning. That it aired back-to-back with Wendy's ouster also made sense, because Wendy had also been fighting an uphill battle all season. Lingering on Aubry's departure for a week — with no merge and re-entry in sight — might have been too dark a nadir for this season to bear. In contrast, combining the two disappointing departures, and ending it with Wendy's upbeat exit and Aubry's "time for some payback" promise for next week provided a modicum of hope. Edge of Extinction isn't a great season, but the one thing the titular twist does well — pulling booted contestants (and their fans) back from the brink of despair via the promise of re-entering the game — really helped these two hours balance the pathos with some positivity. Do the recipients of the two challenge "advantages" introduced this week — Chris's bamboo sticks and string vs. Keith's extra knots, which he plans to deploy against Chris — provide any clues? Will either advantage be relevant? For the sticks, probably not (as is standard for Edge of Extinction sequences ... like, say, Aubry's extra vote advantage). For the knots, maybe. What we've seen of the challenge suggests it doesn't really favor size or strength, so delaying Chris just a bit might counter his general athleticism, and make everything else more even. The previews show the re-entry challenge to be more than just "Jail Break" (as was suggested by the sticks). Notably, the challenge ends on (or at least includes) the "Puppet Master" hanging table maze, previously seen when Cochran almost knocked Ozzy out in the Ep12 duel of South Pacific, and when Sierra Dawn Thomas nearly ended Mike Holloway's end-game immunity run in Worlds Apart. These are challenge elements that almost anyone present could win. Maybe it really is "Time for some payback." At least until the re-entering player is voted out again at the very next Tribal Council. Kama not-so-strong? On the one hand, original Kama is positioned well here: With eight people left, they could just stay #KamaStrong and steamroll the four original Manus, if they wanted to. On the other hand, there's no real indication they want to. There are two main divisions within Kama: There's the newbies vs. Joe (and Aubry?) battle, then there's potentially also a fight between the post-swap Kama descendents (Kama II vs. Manu II). Joe's argument to Julia about resentment over their continual winning is a good one. 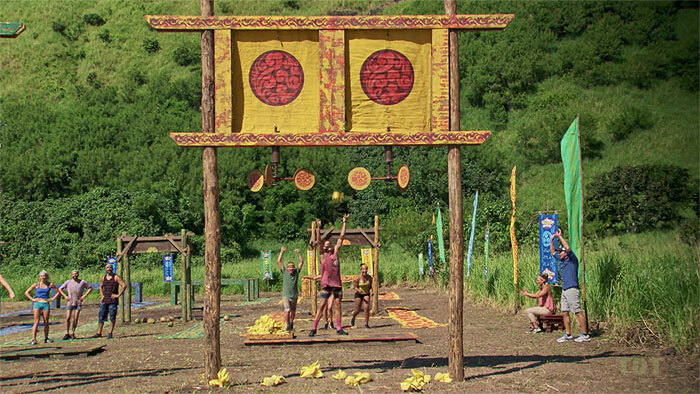 Look no further than the Healers tribe to see how two smaller groups can gang up on the too-successful yellow tribe after the merge. Joe Kama: Joe has some allies. Aurora clearly is #TeamJoe, as she said in the premiere. Ron and Julia both seemed to be trending Joe-ward in their allegiance this week, too. Normally, a successful alliance in the post-merge is one that's been tempered in the forge of multiple Tribal Councils, and shaped into a hardened, honed weapon. Is it possible the reverse could be true here? Lesu seems about ready to implode, Victoria seems willing to work with Eric and Gavin on Manu, but not go to rocks with them. With the notable exception of Julie, most of still-Kama (Joe Kama?) seems willing to stick together for their own good. Alternatively, maybe this double episode's Joe-centric glow was all just misdirection to make us all forget he'll probably be first out after the merge. Hope for Manu II: Victoria's hilariously rock-phobic stance notwithstanding, this trio did seem to work pretty well together. We've never really seen Eric and Gavin apart from each other, and they pledged to stay true to each other this week. They could easily pull in a Julie, or a Wardog, or David (any of the Lesus, really). After all, amid the whispering, there did appear to be some kind of deal being made at the double Tribal. Could Lesu and Manu II just unite to pick off Joe and Julia, as Joe foretold? If so, Victoria's superior social game and lack of appearing like a challenge beast could set her up for an impressive post-merge run. Lesu no more? Again, tribes that have to vote a lot in the pre-merge (Jalapão, Foa Foa, Matsing) tend to remain powerful allies in the end-game. Nothing about Lesu suggests this is the case ... except, ironically, maybe David and Kelley? Just about every Lesu scene this week featured someone bad-mouthing someone else on the tribe. Wardog is worried about Lauren's health. David thinks Wardog doesn't contribute anything in camp and is always transparently plotting. 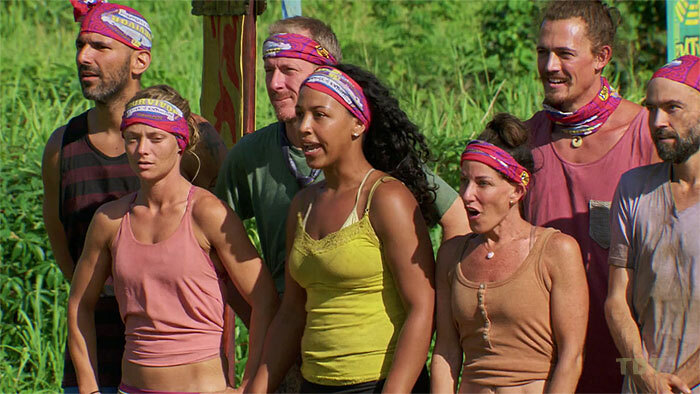 Lauren and Kelley yell in frustration at Wardog during challenges. Kelley calls David a girl, and thinks Wardog is a "dictator" (as does Lauren). Some subset of these people probably will stick together, and Kelley is central to everyone's group, but it's hard to imagine Lauren lasting much longer physically if she can't eat, and as a big-looking guy who engineered a lot of pre-merge boots, Wardog could be an easy post-merge target. Then again, maybe he'll find his people with the Gavins and Erics of the world. And through it all, miraculously, David has yet to receive a single vote against him. Despite their squabbles, it would be amazing if this dysfunctional family could somehow bicker and grumble their way all the way to the end. They have four people. That's all they need to get to fire-making! Is this too much to hope for? Joe competed in no fewer than four three-tribe challenges over this week's two episodes, and Kama finished in first place in every motherfucking last one of them. This launched him all the way up to a tie for #3 on the all-time list for tribal or team challenge wins. Dalton Ross asked Jeff Probst about it this week, and Probst gushed, "There really hasn't ever been anyone, at least that I can recall, with this kind of challenge dominance." Looking at the numbers, Joe's actually had a pretty similar record to Andrea Boehlke (Joe is at 21 wins, 2 second-places in 30 challenges; Andrea 21 wins, 2 second-places in 32 tries). Other people aren't that far behind: James Clement (19/34), Jonathan Penner (18 wins, 2 seconds, 34 challenges), Tyson Apostol (17/27). The difference with Joe is mainly that he does it all: the physical stuff, like pulling a boat; the mental stuff, starting with zipping through the puzzle in his very first challenge in Worlds Apart; and even skill stuff, like tossing sandbags. Most people have a particular strength in challenges, and don't step up for every hero role. Joe does, and clearly, he must be doing it right a good percentage of the time, if he's able to avoid every pre-merge Tribal twice. With the merge upon us, Joe will of course now be the #1 vote target at every subsequent Tribal Council (barring individual immunity), so it'll be difficult for him to extend this streak. He's the only player to never attend Tribal in the pre-merge in two seasons of Survivor. And while doing it once is not necessarily an indicator of personal greatness (Julie also avoided Tribal this pre-merge, and did so while sitting out 3 of the 9 challenges), doing it twice just doesn't happen. Until now. One of Joe's post-switch Ta Keo buddies in Cambodia, Terry Deitz, actually came pretty close. During his one-man crusade against Aras in Panama, Terry failed to vote anyone out from Day 16 on, until he left the game on Day 38. Well... *except* for one tiny little vote that only ended up working because of circumstances beyond his control: The Final four vote. He teamed up with Danielle at F4 to force a tie, voting against Cirie. Cirie then lost at firemaking, a result that ends up giving Terry credit for his vote. But the outcome wasn't even shown in the same episode! Today there wouldn't even be an F4 vote! Sigh. If not for that vote, Terry then went on to vote out to play another 2 days in Panama and another 13 days in Cambodia without voting anyone out. Almost a (still intact!) 35-day streak, if only Cirie could have made fire more quickly. Oh well. Terry and Joe seem like kindred spirits, and Terry at least has his Cambodia streak still going. If he plays again, maybe he can catch up to Joe eventually. Only 38 days left to go! The no correct votes club: An easily searchable source of such streaks is to look for people who played their entire season without voting anyone out. The leader there is ... Joe Anglim, 31 days in Cambodia. But a few more people have made it past the merge without a successful vote on their résumé: Cole Medders (24 days) and Jessica Johnston (19 days) in Heroes v. Healers v. Hustlers, Nick Maiorano (22 Days) and Neal Gottlieb (19 days) in Kaoh Rong, Chris Noble (also 22 days) in Ghost Island, and RC Saint-Amour (20 days) in Philippines. Should any of these people play again, their streaks remain active. These are impressive numbers, but there are likely some longer Tribal-whiffing (and/or -avoiding) streaks that occurred within a season. The problem is, these streaks are much more difficult to pick out, and really require going through every season, contestant by contestant. We've done our best, but we don't claim to have found every one. The Redemption riders: One obvious Tribal-avoiding example is Matt Elrod in Redemption Island. He voted out Francesca on Day 3, then attended just two Tribals the rest of the way — getting voted out both times — before eventually being eliminated in the final duel on Day 36. That's good for a 33-day in-season streak (which is still active, although he's pretty unlikely to want to play again), which is longer than any of the zero-vote streaks above, and is third-best after Joe (and the one below). Either way, Matt's streak is the longest single-season one, although obviously the Redemption Island component of his run seems asterisk-worthy. So does Ozzy's South Pacific-to-Game Changers streak. Ozzy voted out Papa Bear on Day 8, then voted wrong at six more Tribals, getting voted out thrice in the process, before finally leaving on Day 38. But a lot of that was on Redemption. He then went 16 days on Game Changers before finally attending Tribal Council, where he voted out Sandra, for 46 days total. Again, with an asterisk. Christine Shields-Markoski also had a 20-day (Redemption-extended) run in South Pacific. Fret not, though, several non-exiled contestants managed similar streaks, some of which also span multiple seasons. Split-season streaks: Randy Bailey has a still-active 32-day Redemption- and Extinction-free multi-season streak, stretching from Day 6 of Gabon, where he voted out Gillian, through his boot on Day 30, then continuing through his entire 8-day Heroes vs. Villains run. 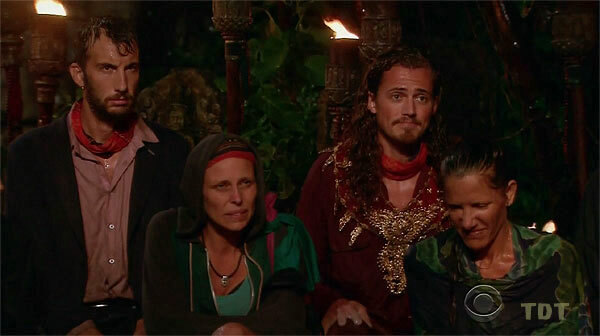 Tyson Apostol voted out Jerry Sims on Day 9 of Tocantins, then nobody else until he was booted on Day 27, then avoided Tribal on Heroes vs. Villains until Day 8 ... where he voted out Randy. JT Thomas has an active 25-day streak, going from the James boot in Heroes vs. Villains (Day 15) through his own boot (Day 27), extending through his entire Game Changers run (13 days). Gervase Peterson had a 24-day run from voting out B.B. on Day 6 of Borneo through his own boot on Day 30. He then promptly ended it with the Day 1 vote in Blood vs. Water, putting him at 24.5 days total (thanks to Day Zero). Late first (correct) votes: Cassandra Franklin mostly coasted on Moto's pre-merge success in Fiji, and voted for Lisi on the Liliana boot. So it was Day 27 before she voted anyone out. Similarly, Jason Siska managed to play the first 27 days of Micronesia before finally voting someone out (Ozzy). Mike Skupin voted out Kimmi in S2, then was medevacced two days later, but went all the way to Day 22 of Philippines before voting out Jeff Kent, for a 24-day streak. Reed Kelly made it to Day 24 in San Juan del Sur before finally voting out Jeremy Collins. Keith Nale voted wrong his last two Tribals in San Juan del Sur, then avoided Tribal entirely during the pre-merge of Cambodia, for a two-season 22-day streak. 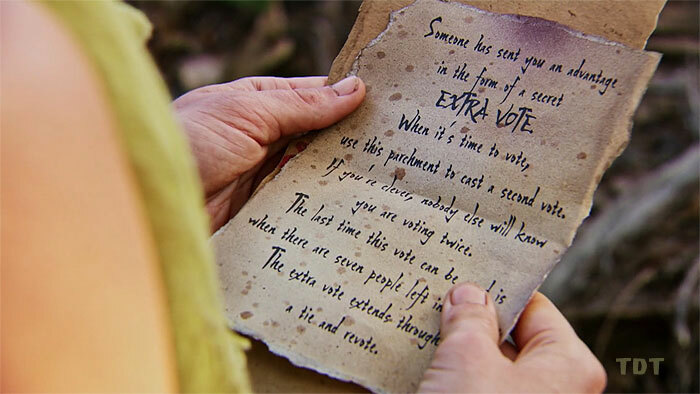 - Advantage: None - It's fitting that the Edge of Extinction twist is what Ghost Island was originally intended to be (as revealed at Inside Survivor), because the advantage put into the game from Edge of Extinction this week was just as game-changingly powerful as every advantage that Ghost Island produced. If we have to see Extinction every week from here on out regardless, making it the dumping ground for all the useless one-off advantages that popped up in Heroes v. Healers v. Hustlers and Ghost Island is ... fine. At least it gives the people there something to do. - Luck of the double-Tribal draw: Having two tribes attend Tribal Council together to vote off one person is not a particularly good twist. The stakes are high this close to the merge, and because the two tribes can't talk to each other beforehand, it's basically all bluffing/guessing. And whispering. Lots and lots of whispering. The players know what's going on, but the audience doesn't, which isn't great TV. 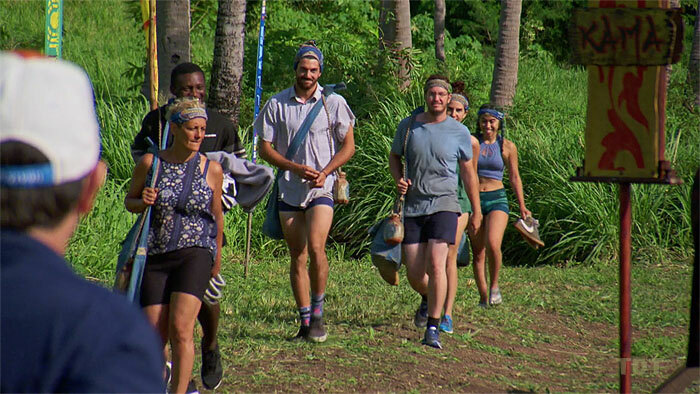 This time it seemed better than the Malcolm boot in Game Changers, but that was mainly for two reasons: (1) Both tribes were evenly matched, so it raised a realistic specter of a rock draw, and (2) So many people were not willing to actually do that, it was interesting and potentially hilarious to see which side would crumble first. Survivor got lucky the Kama is unbeatable. But what if Manu had won the IC, and we'd had the five Kamas just blithely picking off someone from the four-person Lesu tribe? (Probably Wardog, because Lauren and Kelley had yelled at him during recent challenges.) Where's the drama there? Or, even worse, what if Lesu had somehow won, and all eight remaining original Kamas had just unanimously voted out Wendy? Gordon Holmes at XfinityTV.com: "Joe Knows Challenges"
Dalton Ross at EW.com: "Revenge of the newbies"
Stephen Fishbach at People.com: "What's the Best Way to Blindside Someone?" Andy Dehnart at Reality Blurred: "Survivor: Edge of Extinction's double episode delivers 20x the entertainment"
Rob Cesternino & Stephen Fishbach at RHAP: "Know-It-Alls | Edge of Extinction Episodes 5 & 6 Recap"
Rob Cesternino at RHAP: "Gabby Pascuzzi Recaps the Episodes 5 & 6 of Survivor: Edge of Extinction"
Emma & Matt at The Purple Rock Podcast: "Edge of Extinction Episodes 5&6: It's Like the Worst Cocktail Party Ever"
Dom Harvey & Colin Stone at The Dom & Colin Podcast: "[title tk] -- Episodes 5+6 Recap/Analysis"